Only at Best Buy Create secure, reliable copies of important documents with this Western Digital easystore portable storage bundle. 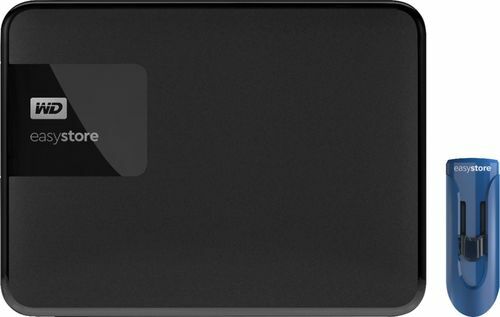 The 4TB hard drive accommodates a large volume of videos and pictures, and the WD software ensures automatically updated copies of files via continuous or scheduled backup settings. This Western Digital easystore portable storage bundle includes a 32GB USB flash drive that offers extra space. Features4TB storage capacity Provides ample space for storing documents, photos, music and more. USB 3.0 interface Offers an easy-to-use connection to devices. Backward compatible with USB 2.0 for simple connection to your computer. USB-powered. Data transfer rates up to 5 Gbps with USB 3.0 Enable a rapid response when updating files. Automatic backup options Allow you to use compatible software to back up your files to the server. Portable design Lets you take your data on the go. Compatible with Mac and PC For flexible installation options.